Dark times fell upon Northern Ireland during the latter half of the twentieth century, with rioters roaming about the streets of Belfast and beyond, and deadly attacks by IRA and other radical movements every left, right and centre. Making a coherent film centred around these blood-fuelled conflicts would be difficult to do, especially seeing how it’s still fairly fresh in people’s minds, but not entirely impossible – and, for its well-being, we get a great deal out of ’71 that’s enough to give us a glimpse into the terror but also be its own story at the same time. Debuting director Yann Demange leaves a strong first impression with his style of filmmaking – think of his nail-biting and almost documentarian vision as something only a protégé of Paul Greengrass would conjure up, especially considering that director also made an IRA drama, 2002’s Bloody Sunday – which creates a tense and nightmarish portrayal of this dark part of NI history. One scene in particular stands out for its completely out of nowhere rise in surprise and unnerved stability, taking place mostly within one single shot and using tightly wound cinematography to create that uneasy feel of dread and horror – to say any more about it would be to bring about certain spoilers, but for now we can say it takes place outside a pub. With his own pace and sense of unease, Demange is successful in creating this particular environment and is a talent we’re keen to see go on to further, and exciting, prospects. At its on-screen centre, however, is Jack O’Connell in a very subdued but no less tense piece of acting. What might be the most interesting thing about his character, and thus his performance, is that he hardly speaks in the film – almost like Ryan Gosling in Drive, his lines of dialogue and exchanges with other characters are a rarity, and every other time we’re only seeing his wordless reactions to events around him. After a suspenseful chase sequence around the end of the first act, his only reaction is to pant heavily and attempt to hold it together after witnessing the atrocities beforehand. It’s a very unconventional leading man performance, and after this year’s earlier prison drama Starred Up he seems to be heading more and more into that realm of one of this country’s most promising and diverse young actors (a tradition he seems set to continue with a lead performance in director Angelina Jolie’s forthcoming Oscar botherer Unbroken). That being said, despite O’Connell’s fearless dedication to the part, he is unfortunately saddled with the least interesting part. The fact that he doesn’t talk that much, while welcomed and an unexpected edge, leaves us with little information about what kind of person he really is. The reason this worked for Gosling in Drive was because he used his character’s mysteriousness to his advantage and made him an interesting presence that we instantly wanted to know more about. We don’t get the same think with O’Connell here, however, since his character never strays further than the archetypal “wide-eyed innocent” role which in itself does not warrant enough interest from the audience member. He has little arc, save for one particular motif that bookends the movie where we see him play and bond with a young boy who’s meant to be his brother, or his son, or nephew (we have no idea, the movie doesn’t explain who the boy is very well). Aside from that, we don’t get the chance to know much about him and even then it’s not an interesting tease. If it falls short on its lead protagonist, however, then the side characters certainly put things back into order with their more fleshed-out roles and performances. Sean Harris has a prominent role as a fierce intelligence operative, and Killian Scott – previously seen in a scene-stealing performance in Calvary – makes for an intimidating, if slightly one-dimensional, Brit-hating Irish hooligan. Good Vibrations’ Richard Dormer also impresses in a memorable role later in the film as a doctor who takes in O’Connell’s wounded hero, while there’s much to imagine about the character of a mob boss with a moral compass, played by another Calvary native David Wilmot. All give excellent and gripping performances and make for interestingly-crafted characters that do, sadly, outshine the lead. This reviewer is not going to go on about how the film represents the events of the Troubles in Northern Ireland, partly because they don’t want to give an unintentionally one-sided view on the era but also because they know so little about them that it would be considered inappropriate to talk about them. What they are going to go on about is if ’71 succeeds in being a film in its own right, and for the most part it succeeds; it’s the closest this country is going to get in making its own Vietnam movie, and while the streets of Belfast may not be a wholly acceptable substitute for the actions of the Vietcong it comes pretty damn close to replicating it for a British audience to endure. 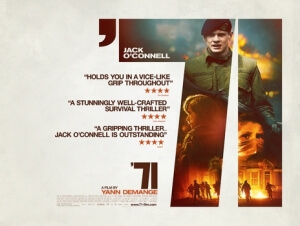 ’71 is a tightly intense thriller set in the streets of early 1970s Belfast, with impressive and on-the-nose direction by Yann Demange and a brilliantly unconventional leading man performance by Jack O’Connell, who does well enough to disguise the fact that his supporting characters – all played brilliantly by their individual actors – are infinitely more interesting.